L 22-25″(56-64 cm) W 58-72″(147-183 cm). Description: Dark brown above, white below. White head with strong dark brown eye stripe. 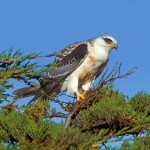 Males usually all white below, while females will have a band of dark streaking across breast. 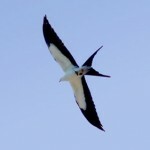 In flight, wings are bent distinctively at wrist. Also dark wrist patch on under surface of wing. Habitat: Uses rivers, lakes, and reservoirs that have fairly clean water and a healthy fish population during migration. 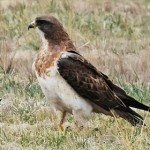 Where in Nebraska: Uncommon to occasional statewide spring and fall migrant. More common in the east where there are more larger bodies of water. Does not breed in Nebraska. The Osprey migrates to Central America and northern South America where the first year birds stay for an entire year before migrating back to North America. Status: In need of conservation measures due to decreased nesting success from problems associated with DDT and other toxic chemicals. 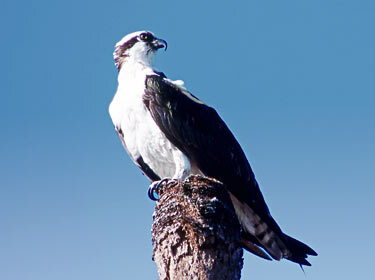 Fun Facts: Osprey are the only bird of prey that feed exclusively on fish. When an adult Osprey brings a fish back to the nest it carries it head first to make it more aerodynamic.